Nagi is a 12-year-old orphaned girl living on her own in a cottage in the woods. In the valley below a massive city has been flooded and deserted before she was even born. Surrounding her is what is left of humanity, huddled together in isolated villages. One day, while foraging for food, Nagi stumbles upon a two-metre-long spider. She names it Asa, and it follows her home. 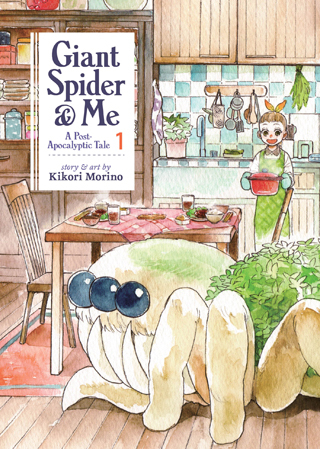 Giant Spider & Me is a 2016 manga by writer/artist Kikori Morino, whose first volume has just been published in English by Seven Seas Entertainment (translation by Adrienne Beck). It's a wonderful new series with a very simple and traditional manga style, and a surprisingly bright and heartwarming tone. It's also one of the more original concepts for a manga I have noticed of late. Japan is well renowned for its comparatively unusual story concepts, but a 12-year-old making friends with a giant spider is one of the stranger ones. It certainly makes for a book that readers are unlikely to forget in a hurry: arachnophobes potentially need not apply. Asa is, of course, not really much of an arachnid. There are the eight eyes and legs, of course, but also an abdomen coated in soft leaves, and a row of goofy teeth. All in all it seems more Pokemon than actual spider, and that helps to make it a nicely adorable co-star. There is some nice world-building in this first volume, slowly drip-feeding the reader details on what has happened and why the world has changed so much. What is remarkable is that the post-apocalyptic environment and giant spider are almost just window dressing. At the end of the day Giant Spider & Me is a cooking manga. They have a lot of very specifically Japanese genres of manga. Cooking manga always strike me as one of the more unusual. They're not just stories about people who like cooking; they're effectively cookbooks masquerading as comics. Each chapter of Giant Spider & Me sees Nagi collecting ingredients and then cooking them step-by-step with a recipe that the reader can then copy for themselves. It's peculiarly Japanese, although I for one would love to see the trend spread to Batman Drinks Wine or Spider-Man Cooks Souffles. I wonder if American publishers are missing a trick. Released this month, Giant Spider & Me seems likely to be the weirdest comic release for February. I'd be slightly surprised if something else came out that was this weird - or as weirdly charming.